Even before we started thinking about our joint project “The Daily Dose”, we dreamt of having our own office space. Maybe at home, maybe at a shared office in a co-working space – main point, it would have to be pretty! We imagined it to be a bright, modern and creative space where we would meet every day to work on The Daily Dose. 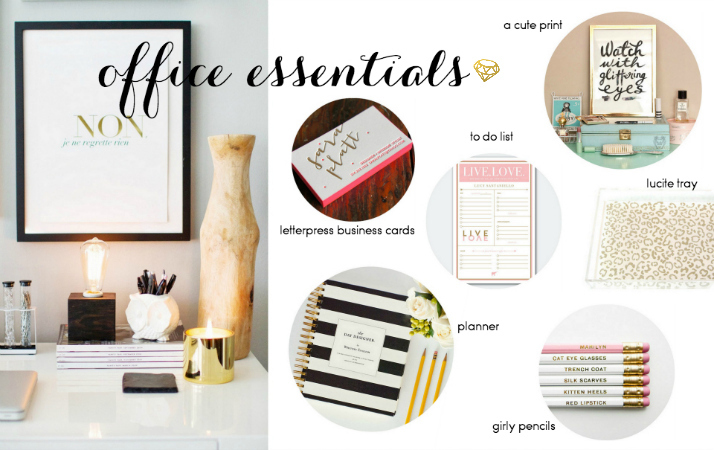 One thing that we already got ourselves, and that is one of our absolute must-haves when it comes to office essentials is the Day Designer by Whitney English. It is a super pretty planner that’s custom made for creative entrepreneurs – we love and use it everyday, and it even feels a little bit like we already have that dream office! 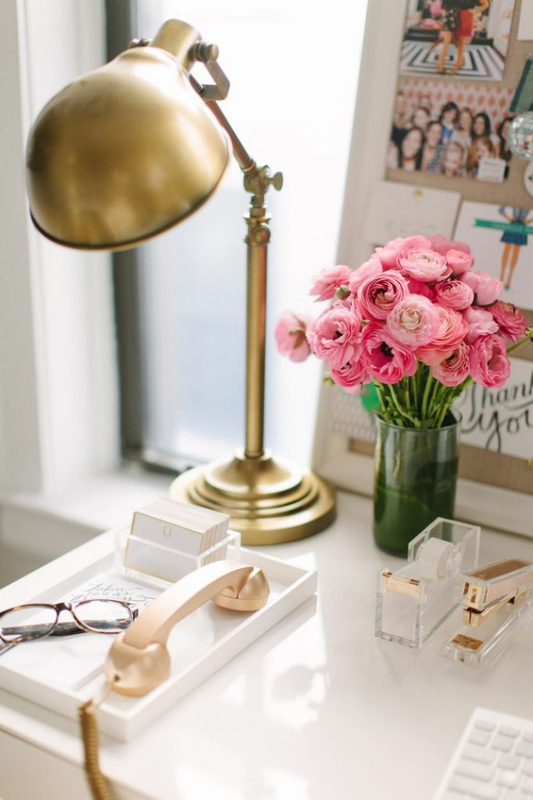 A definite must in every office is a pretty print on the desk. It just makes working so much more fun when you’re able to look at something cute! This super practical planner will make your life so much more organised while being super adorable at the same time – it just combines the best of both worlds, fashion and business. Those pink and white pencils with gold inscriptions are girly perfection and would look really cute in a white mug – an instant upgrade for every boring desk! Another piece that’s already in our possession. That lucite tray has the perfect size for holding papers, pencils or vases and helps you keep your desk organised. We think we don’t have to explain that business cards are a must for every entrepreneur. But it doesn’t always have to be the boring, plain white ones – these letterpress business cards with a neon rim are just so much more fun! A to do list helps us get through stressful days, they are our brain when we tend to forget stuff and it feels so good to tick off the things we got done. Könnt ihr mir verraten, woher dieser tolle Tesabroller und Tacker (in Plexi/gold) sind? Die verschicken sogar international – ist aber laut eigenen Angaben der Website relative teuer :( Aber der Tesaroller aus Acryl & Gold ist wirklich SUPER hübsch!! Der Lucite Tray ist ja wunderschön! Ihr habt immer so schöne Ideen und Anregungen! das Tablett ist wirklich ein TRAUM! Wir haben beide eines :) Kathi mit Gold/Rosa Chevron-Muster & Vicky mit genau dem abgebildeten! WIR LIEBEN ES! !